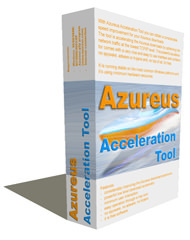 With Azureus Acceleration Tool you can obtain a considerable speed improvement for your Azureus downloads. The tool is accelerating the Azureus downloads by optimizing the network traffic at the lowest TCP/IP level. This powerful accelerator comes with a very nice and easy to use interface and contains no spyware, adware or trojans and, on top of all, it’s free. It is running stable on the most common Windows platforms and it’s using minimum hardware resources. If you need more information please contact the developers of Azureus Acceleration Tool (Download Boosters), or check out their product website.